We have been packaging and selling under the name Alumiweld since 1986. Before this amazing invention, Aluminum could not be welded, brazed, or soldered without using highly specialize and expensive equipment. Before AlumiWeld, the average consumer was not able to repair anything made of aluminum.This meant that anything that was made of aluminum ended up in the trash or stayed damaged. Now you can repair those items easily with our kit and a propane torch. Manufactured in the U.S., but the location for the market is the entire World. 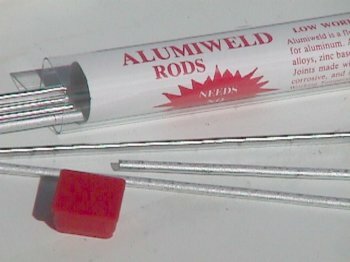 The aluminum welding repair kit is called "ALUMIWELD". It has been available since the 1970's within the United States, yet it had not been marketed properly during that period. All locations for major distribution within the U.S. are now being fulfilled. Hence the international market is open. Product: ALUMIWELD is a welding rod that is able to repair any aluminum metal by using a PROPANE TORCH ! 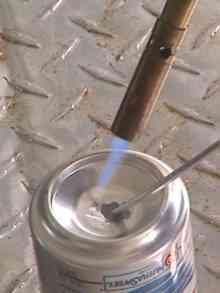 Also will repair Zinc based metals, (Pot Metal), Mag-Alloy and Galvanized Steel all with a propane torch. AlumiWeld is capable of repairing copper and brass to aluminum.